As the national conversation about the Kinder Morgan Trans Mountain pipeline goes thoroughly bananas, one thing is becoming crystal clear: this conflict is likely to get worse before it gets better. Thankfully, there are people out there who specialize in resolving conflicts like this — people like Canadian Adam Kahane who has been credited with helping to end Colombia's civil war. For Kahane — the author of the book Collaborating with the Enemy: How to Work with People You Don't Agree With or Like or Trust — the most striking thing about the pipeline debate is that the rules are not clear. "The question of who gets to decide on what in Canada between the provincial and federal governments on one hand and Indigenous rights holders on the other hand is not settled," he told DeSmog Canada in an interview. While many statements by politicians pretend there's one right answer and agreement about what's in the "national interest," that too is up for debate. "To say 'this is what's needed for the good of the nation' gives an overly simplistic answer to a very difficult question, which is: whose good is being talked about here?" Kahane said. And then there's the question of whether the hysterical political statements are part of a negotiation strategy we're not aware of. "People say all sorts of things to try to shift the terrain to their advantage," Kahane said. We asked Kahane to shed some light on the dynamics at play in the pipeline debate, based on his experience mediating conflicts around the world. What do you think about the heated rhetoric that's happening with our political leaders right now? I was very surprised at the rhetoric, especially when Trudeau and Notley both said … within the last few days 'this is going to happen.' That surprised me because it's not the sort of thing politicians normally say. I would have expected them to say 'we're going to try to find a way forward' and 'this is complicated, but no doubt we can work it out.' But when you say 'this is going to happen' for me it means two things: first of all, that there's only one correct answer to this. It has to be this way. And mostly when there are disputes like this, actually the way to move forward is to make some sort of compromise or new idea. The way things end up is not the way things are at the beginning. That's an unusual thing to say about a complicated and contentious situation. The second thing is when someone in authority says 'it is going to happen,' it implies that if necessary they will impose it … Usually you impose things only when finding a mutually agreeable solution has proven to be impossible or where the other actor is illegitimate. So it's an unusual thing to say about a public policy issue. Have you seen situations before in different contexts where a government has started to say 'this will happen' when there's a contentious situation? Does it bring up any parallels for you? What's interesting to me about all the people who are saying 'it's going to be like this' is: what is their power to impose the solution they want? Does the federal government have the power — constitutional, regulatory, financial or, in an extreme situation, with security forces? Does the government of Alberta have the power, including through the trade sanctions that have been discussed? But similarly do the opponents of the pipeline have the power — legal or political or through their willingness to protest and be arrested? Does anybody have the power to impose the solution they want regardless of the others? And if not, then who is going to negotiate? Normally when there's a situation where different people want different things, there's a lot of fuss and eventually some kind of agreement is come to. In the end, it's not a unilateral solution. It's a negotiation or collaboration or whatever you call it. What I can't tell is: to what extent are the statements … really meant as a declaration of unilateralism … or is it part of a negotiation? That's not clear to me. Are the people making these statements on all sides announcing their intention to force … or are they simply being vocal about their positions as part of a negotiation or collaboration? For me, what makes this very complicated and unusual is the question: who has power over what is not clear because there are many constitutional questions here including, I think, questions about the power and authority — political, constitutional, moral authority — of different First Nations groups. It's not as though there's this one rule here, everybody knows what the rule is and the question is who's following the rule or not following the rule. No, the rules about who gets to decide about what, especially about land use in unceded territory, is not settled in Canada. It seems like in much of the news coverage and political statements on this, there isn't much addressing of the real differences that are at play. There's a lot of posturing, but there's almost a logic schism. People aren't discussing the same thing. Is that something that you come across often in your work? Yes, and I would go further than that. I think there is not an acknowledgement that there are real differences, that there are multiple conflicting objectives. Many statements are pretending that actually there is one right answer, but something that makes it even more difficult is that there is not acknowledgement that when we talk about the good of the whole, that there's not one whole. There are many wholes here. So when many people say 'the good of the nation,' what is that? Canada? Alberta? B.C.? Burnaby? The different First Nations that are affected by the pipeline? To say 'this is what's needed for the good of the nation' gives an overly simplistic answer to a very difficult question, which is: whose good is being talked about here? When B.C. people say, 'this might be good for Alberta, but it's not good for those of us along the coastline of B.C.,' not only are there real differences that are not being discussed, there are different wholes that are being ignored. The fact that there is not one superior whole in Canada — the fact that it's a confederation of multiple wholes where the rules about some of the wholes, especially the Indigenous wholes — makes it difficult to assert that this is the one correct answer. And yet that is something that we see. Is that common in political rhetoric that you see around the world, this assertion of one correct answer when it's quite obvious to anyone who's paying close attention that there isn't one correct answer? It's very common that politicians or chief executives or community leaders, it's very common that authorities say 'it's like this. This is what matters. This is the good of the whole. This is the correct answer.' They try that and sometimes it works and sometimes they simply don't have the capacity to impose their answer. That's what's really not clear to me about this situation is when Prime Minister Trudeau says 'it's going to be like this' does he actually have the constitutional and political and moral authority to make it like this? It doesn't look that simple to me. People do this all the time, all around the world and in every sphere of life … That's called forcing and sometimes it works, but the problem with forcing, as everybody knows is I try to make it the way I want it to be, you don't like it and you push back and we either ping pong back and forth or we get stuck. That's the problem with forcing. Have you seen situations like this play out in Canada before, where there's been these statements that a leader will impose their desired solution upon a certain jurisdiction? I don't think it's an analogy, but it's another interesting example of this. I was talking to somebody today about: what are different ways that different actors have tried to impose an answer to the question of Quebec separatism? The FLQ tried to impose an answer through, amongst other things, kidnappings and bombings in the October crisis. Then Prime Minister Trudeau tried to impose an answer first through the use of the military and then through a constitutional settlement, then the PQ government tried to create an answer through the referenda. And actually, in each of these cases, people were trying to say 'it's going to be like this, we're going to make it like this' and it actually didn't turn out like this. The story keeps going and keeps unfolding in unexpected and unpredictable ways. With respect to the current situation, that the people who are saying 'it has to be like this' — whether it's the Alberta government or the B.C. government or the federal government or the protesters — I'm not confident that any of those people have the way to make it the way they want it to be. And furthermore, I'm not confident that if they do succeed that it will last. That's the problem with forcing is it tends to be temporary. Eventually the people who were on the losing side of it find a way to get back in the game. I'm interested in such situations in how is it possible to find a way forward collaboratively, through negotiation. This is what I'm not seeing in this current situation. Maybe it's taking place behind the scenes, but I don't see it. The dialogue is very heated and quite polarizing. At the same time, when I think about the situation, sitting down and trying to collaborate, on some issues maybe there isn't a middle road. What if there isn't a collaborative solution in the sense that B.C. simply doesn't want a new oil pipeline and Alberta absolutely does want a new oil pipeline? I don't believe that there's only two answers — that either there is a pipeline as currently proposed or there isn't. I don't know what they are, but I'm confident that there's more than two options. Options about safety, options about governance, options about economics, options about control, options about volume, options about all kinds of things. Nelson Mandela once said that one of the features of the complex is the way things end up can't be seen from the beginning. The exact quote is: "One effect of sustained conflict is to narrow our vision of what is possible. Time and again, conflicts are resolved through shifts that were unimaginable at the start." One of the features of these conflicts is polarization. There are lots of different ways to do things and I don't know whether a solution that works for more of the wholes can be arrived at, but stating that it either has to be my way or no way doesn't move us forward much. I don't believe the statement that it's either like it is now or it's the opposite. This is not plausible to me. You raise this interesting tension that there's likely this negotiation or collaboration happening behind closed doors and there are also these public statements that are potentially playing some role in that larger negotiation game. Probably. Maybe all of this is just part of the negotiation. That would be a normal thing. People say all sorts of things to try to shift the terrain to their advantage … I suppose in a constitutional democracy if you really litigate everything to the Supreme Court, there'll be a right answer and a wrong answer, but that's a long road. Maybe that's how the answer will be arrived at. That's why some things in Canada have to be settled in the court. Image: Paul Souders / Aurora Photos. 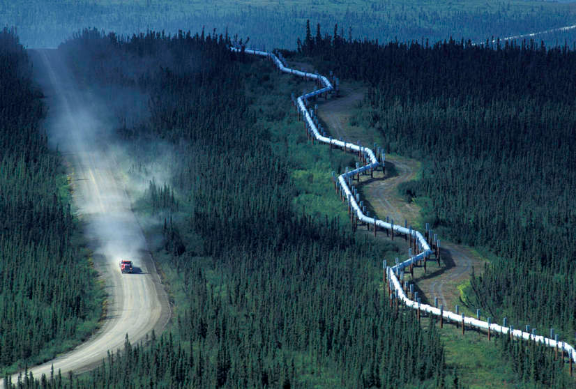 Truck drives down Dalton Highway by snaking Trans Alaska Oil near Yukon River.